first met Andy Mulcahy at the Victoria Police Station in 2002. No, I wasn’t visiting him in The Big House, that’s where the Victoria Secular Humanist Association (VSHA) met on Sunday Mornings. [Andy] joined the Canadian Scottish Regiment at barely 17; it was 1939. Preparation for war took Andy across Canada and Europe, right up to the Normandy beach landing on D-Day June 6, 1944. Some people probably thought that was exactly where a bunch of atheists and agnostics belonged; however, we met in the Police Department’s Community Meeting Room, and there were no charges. Husband Jerry and I had wanted to join a humanist group for years, but there wasn’t an opportunity, living on an off-grid island. But once we found our place in Victoria, and bought a car, we decided to look up the group. Andy was the chair; the small group had decided not to use the title of president, wanting to be egalitarian. But they did need a treasurer, and Andy approached me about the job. Over time Andy’s history was revealed and I felt his experiences should be recorded. In 2007, thanks to the editing of respected author Tricia Dower, Silent Girl (Inanna 2008) and Stony River (Penguin 2012), VSHA published Stories of Secular Humans about the lives of three remarkable VSHA members who had been profoundly affected by the Second World War. It was October 1944, the dawn after the terrible Leopold crossing, when Andy awoke “to see dead Germans nearby and to hear moans and cries.” He said, “Out of the blue it occurred to me that there was no such thing as a god. I didn’t mention it to anyone at the time because I thought they already knew. I didn’t want to look like a fool...it all made sense.” He reasoned that belief in god, like Santa Claus, was for children. The fighting ended for Andy at Heseler Feld; hit by an MG 42 bullet. His release from hospital had been held up, so on VE-Day May 7, 1945, Andy and a friend sneaked out of the hospital to join the celebration, but by the time they got over a wire fence with Andy’s weak arm and his friend’s leg in a cast – the boys missed the party. Andy left for Canada on a hospital ship the next day. The book is available by contacting www.vsha.ca if you want to read about Andy’s earliest years. They say that organizing secular humanists is like herding cats – surely this applies to the VSHA. Andy and I went from being the best of friends to agreeing to disagree. It started when he decided to retire from the board. For years Andy had generously paid for and produced the VSHA newsletter, politely refusing earlier offers of help from members or our treasury. The remaining members of the board were sad and a bit worried to see him go. We carried on and our membership continued to grow. We had 80 members at that time and in the next couple of years we reached over 100. Andy continued to produce and mail out a monthly secular humanist newsletter including all VSHA events and Marianne’s speaker meeting notes. Andy saw early computers fail spectacularly but was still intrigued by them. Far from being discouraged about the potential of computers, Andy became an early adaptor. He said, “I went to Bellingham, Washington and got a TI (Texas Instruments). It was just a small machine, but was considered the best in the business. It was one of the first ones. You could type in all kinds of mathematical things. But when you started it up again it was completely blind because there was no hard-drive in those days. And then I went to an Atom... and Amiga came next. Amiga has to be the best machine ever built. Again it had no hard-drive; you had to match up these little disks...The only things these computers could do is boot. That was it. Andy has had 100s of “letters to the editor” published across Canada. Besides publishing a monthly secular humanist newsletter, Andy has a blog for his poetry and commentary. His blog is www.SecularSamaritans.wordpress.com and it’s called Modest Monist. Andy said that without a computer it would be rough for him, that he would be isolated. Then he said, “I read about a guy in Winnipeg who walked 40 miles through a blizzard so he could get to read a book. Andy credits books for giving him the depth of information needed to change his mind. But after reading books he turns to his computer. He said, “Books first change the way I think about things, and the computer also helps eject information from my head replacing it with new information.” Every day on the computer he goes to the New York Times, the Globe and Mail, and our local paper, the Times Colonist, as well as the Global Secular Humanist site. That’s Andy – an original and still going strong. Raise a glass with his friends and admirers, August 3rd on the occasion of Andy’s 90th birthday. Nancy P. Swartz has recently completed a MA in Professional Communications from Royal Roads University. She and her husband Jerry divide their time living off-grid on Prevost Island, and in Victoria, British Columbia. They are active members of the Victoria Secular Humanist Association. 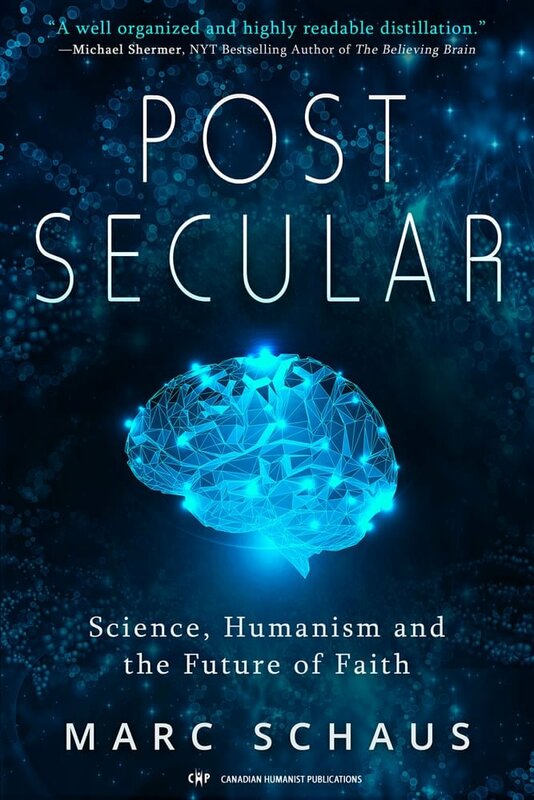 Currently, Nancy is researching and writing a series of articles that reflect secular humanist perspectives.